Agilent Technologies Inc. (NYSE: A) has recently announced two reference libraries for SystemVue, its premier platform for communications and aerospace/defense systems design. 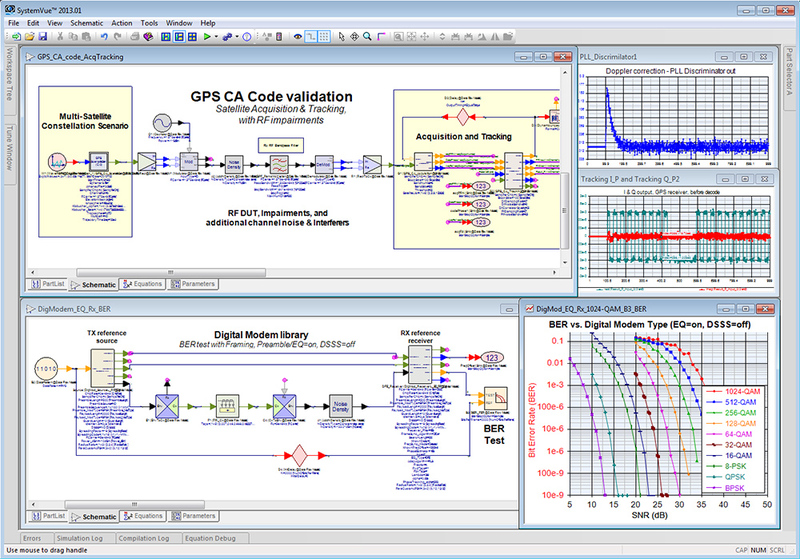 The Global Navigation Satellite System baseband verification and Digital Modem libraries allow system designers and algorithmic researchers to bring instrument-grade standards references into design simulation early in the R&D process. Satellite and communications systems can now be verified under a variety of realistic impaired conditions, before baseband or RF hardware is available, enabling faster deployment of high-performance systems. Next-generation location-based services require robust satellite and telemetry systems offering increased redundancy and higher levels of location coverage and security. To deliver this functionality, military and civilian systems designers are exploring new receiver algorithms for navigation systems, additional frequencies and high-performance RF/baseband architectures. Agilent's GNSS library aids this effort by providing researchers with a GPS transmit/receive algorithm reference, fading and multi-satellite constellation support, and modulation references for Beidou, GLONASS and Galileo. Links from SystemVue to Agilent's RF simulators and test and measurement provide a configurable, multi-discipline design flow for the full R&D lifecycle of satellite navigation systems. "GNSS measurement personalities are generally optimized for high-volume wireless testing, which offers no flexibility to anticipate impairment and interference scenarios in early R&D," said Daren McClearnon, ESL design segment lead at Agilent. "SystemVue pulls together reference intellectual property, the designer's own DSP and RF architectures, and realistic test waveforms into simulated scenarios, enabling designers to validate new ideas before systems are deployed in hardware." Satellite communications designers upgrading to higher data-rate systems require additional framing, synchronization, equalization, re-training, filtering, sampling, and direct-sequence spread spectrum (DSSS) support. Lacking commercial tool support, designers typically handcraft custom toolsets for both simulation and test equipment. Agilent's Digital Modem library eliminates the need for this effort. 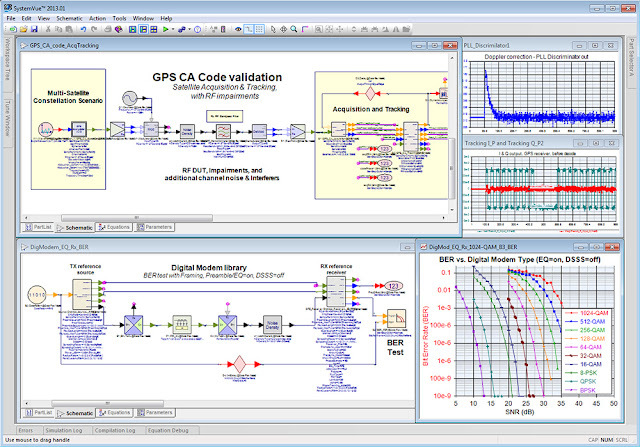 It provides easy signal processing reference models-complete with BER testing-for approximately 35 digital modulation formats used in satellite, military and commercial wireless communications systems. The library also supports signal generation and measurement capture through SystemVue for hardware-in-the-loop testing of digital pre-distortion, DSSS communications and BER applications. Moreover, it enables different design disciplines (e.g., baseband and RF components designers as well as system architects and verifiers) to converge on a common reference for a wide variety of signal formats. The W1919 GNSS library is now available for download as part of SystemVue 2013.01 at www.agilent.com/find/eesof-systemvue-latest-downloads. The W1902 Digital Modem library will be available for download in August. Early access can be requested at www.agilent.com/find/eesof-systemvue-earlyaccess. Pricing for SystemVue starts at $17,687. A free, 30-day evaluation copy is available at www.agilent.com/find/eesof-systemvue-evaluation. Images of the new libraries are available at www.agilent.com/find/SystemVueSatellite_images.